You can join them today by registering for the 2013 Great Central U.S. ShakeOut. Participating is a great way for your family or organization to be prepared to survive and recover quickly from big earthquakes– wherever you live, work, or travel. 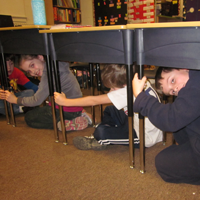 Start here to be included in the 2013 ShakeOut! * You can hold your drill at any time within 2 weeks of October 17. URBANA — When severe thunderstorms, tornadoes, floods, ice storms or blizzards threaten Champaign County, two military veterans are ready to provide leadership to respond to emergency situations and protect lives and property. SPRINGFIELD – Emergency preparedness information is now even easier to find with a new mobile version of the Ready Illinois website launched recently by the Illinois Emergency Management Agency (IEMA). 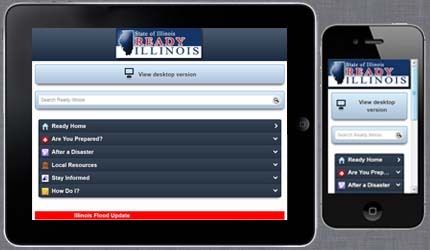 The mobile site (m.ready.illinois.gov) enables mobile device users to access information about emergency preparedness and recovery, weather and man-made hazards and updates on current disasters automatically through their smartphone or tablet. In addition to general preparedness information, the mobile site also includes a “How Do I?” section that provides quick access to information on more than 40 topics, including preparedness for people with functional needs, pet emergency preparedness, American Sign Language videos on disaster preparedness and more. The Ready Illinois website (www.Ready.Illinois.gov) is the state’s one-stop-shop for emergency preparedness information. The website averages more than 37,500 visitors each month, although visits spike considerably during disasters as people seek current information. When historic flooding recently affected nearly half of Illinois this April, more than 80,000 visitors turned to the Ready Illinois website for updates. Preparedness and disaster-related information is also available through the Ready Illinois Facebook page (www.Facebook.com/ReadyIllinois) and Twitter page (twitter.com/ReadyIllinois), both of which also can be accessed through the mobile website. Heat records are falling across the U.S. West and Southwest this week as a deadly heat wave scorches that portion of the country. 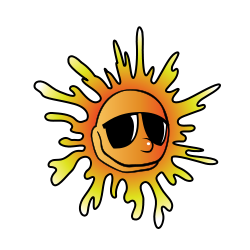 While temperatures in Illinois aren’t expected to reach those extreme levels, the Illinois Emergency Management Agency (IEMA) is urging people to recognize the dangers of extreme heat and stay safe during summer’s heat waves. Summer is here and it seems everyone is spending more time outdoors enjoying warm-weather activities. Officials with the Illinois Emergency Management Agency (IEMA) and the National Weather Service (NWS) want you to remember, “When Thunder Roars, Go Indoors,” so your fun times won’t end in tragedy. The slogan is an important reminder that if you can hear thunder you’re close enough to be struck by lightning, even if the thunderstorm isn’t directly overhead.